RBF Morph will join the Digital Innovation Hubs Annual Event 2018 that will be taking place in November on 27th and 28th in Warsaw (PL). 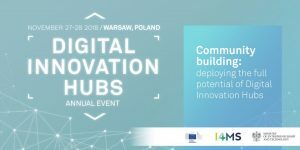 The aim of the event co-organised by the European Commission, the Department of Innovation at the Polish Ministry of Entrepreneurship and Technology, and the EU-funded initiative I4MS is to reinforce the capacity of DIHs so that they can further support European companies in their digital transformation. Digital Innovation Hubs (DIHs) are at the core of the Digitising European Industry initiative. They are already helping companies -especially SMEs- all across Europe to digitalise their products, processes and services through innovative technologies. The event also takes place in the context of the preparation for the proposed Digital Europe Programme, where Digital Innovation Hubs will play a key role. The RBF team will present the advanced approach as well as the achievements of experiment “Cloud-based Additive Manufacturing” developed in collaboration with HSL Italia in the context of the EU FP7 Fortissimo project. For more information you consult the Programme. We look forward to see you in Warsaw!